Leonardo, architectural study - Ashburnham Codex- 2037, paper 4r. You will be impressed also by its colours: the shining pink, white and light grey marble gives the building a magic and soft atmosphere. The original building was however built with terracotta bricks later eschewed in favour of Condoglian marble shipped from Lake Maggiore on the Ticino river, and then along the Navigli directly to the construction site. In addition to admiring the Duomo itself it is definitely worth to take the lift to the roof where you can take a closer look at the statues and spires and on a clear day, you can also get breath-taking view of the Alps. When Leonardo arrived in Milan at the end of 15th century the Sforza family, ruling on Milan, was faced with the difficult task of erecting a domed crossing tower surmounting the intersection of the nave, chancel and transept. They called on the skills of the court architects including Bramante, Francesco di Giorgio Martini and obviously Leonardo da Vinci. At the time Leonardo lived in the Corte Vecchia, where Palazzo Reale now stands, just on the right of the Duomo, so he had certainly many opportunities to follow closely the progresses of the building site. 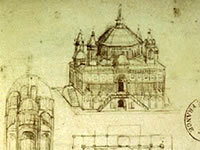 Leonardo made some drawings for the domed crossing tower but these never moved to the construction phase as he probably recognized the superiority of the solution proposed by the other court architects Amadeo and Dolcebuono. Erecting something so prodigiously monumental was a huge enterprise. It took in fact over 400 years to complete and works still continue nowadays. The Veneranda Fabbrica del Duomo is an institution responsible for the conservation of the building, carrying out the necessary restoration works. Marking a clear break from the local tradition of the time, the cathedral, started in 1386, was built in the Gothic International style using marble. This choice was probably motivated by the desire to enhance the dynastic prestige of the Visconti, Milan’s ruling family from 1277 to 1447. After a period of relative inactivity, work started once again under the Archbishop St. Carlo Borromeo in 1567. The work done at that time was mainly internal and brought the church closer to the canons dictated by the Council of Trent. This council of the Roman Catholic Church was aimed at implementing reforms to counterbalance the spreading of Protestantism. In particular greater emphasis was placed on the altar and choir, underlining the centrality of the Eucharist and the word of the priest. The façade was built following a style more reminiscent of Rome’s tradition rather than the Gothic style, typical of northern Europe where the Protestant Reform was spreading. The façade you can admire today was, however, completed much later in 1813 by Carlo Amati. The Duomo is home to what may well be the world’s oldest lift, the “Nivola”. Built in 1600s this ‘lift’ has the shape of a cloud adorned by cherubs and angels. It is still used nowadays to reach the Cathedral's most sacred possession, the relic of the holy nail, used to crucify Jesus. Once a year on the Feast of the Exaltation of the Cross on 14th September, the Cardinal of Milan climbs aboard the Nivola and is hoisted forty metres above the heads of the believers to retrieve the holy relic.